Animation is a great tool to make your website brighter and more attractive. Animations are extremely popular among mobile apps, as it’s a crucial part of the user experience on small screens. But animation in web design is also important, as it makes your web app friendly. We’ve already discussed which types of web animations are most frequently used and for which purposes. Now, we’re going to share our thoughts on which tools you should use to create catchy web pages. But first, let’s take a look at some technologies developers use to animate web elements. With CSS animations, you don’t need external libraries. CSS animations have great performance. You can also easily use CSS animations for responsive development as you can modify your animations with media queries. Instead of making objects for keyframes and timing properties, you can just pass their values directly. SVG stands for Scalable Vector Graphics, a format for vector graphics that can be used on the web. SVG animations look very sharp thanks to vectors having no pixel limitations. No matter how you resize the page, SVGs look the same and don’t lose quality like raster images. SVG elements can be animated with CSS. But SVG also has its own syntax for animation, called SMIL. SMIL is more powerful than CSS for SVG animations, as with CSS you can’t animate some SVG properties like a path’s shape, for example. With canvas animations you can have great performance while animating a lot of visual objects. A canvas provides a visual space where you can make complex animations with high-performance rendering. Canvas animations are about working with pixels, so they’re not vector animations like with SVGs. Canvas animations are a great way to create difficult beautiful animations. By interacting with pixels, you can create complex things and not weigh down the performance. So they’re a great choice for complex drawings and interactions. WebGL stands for the Web Graphics Library, and it’s mostly used for difficult effects and 3D. It’s also possible to use WebGL to create animations for virtual reality (VR). WebGL allows you to render graphics at 60 frames per second. For WebGL animations you also use canvas, but it’s much more difficult and complex. Most awesome creative visual effects are made with WebGL. Now let’s move on to the tools you can use to create different animations on your web pages. Most of the tools we’ll discuss are external libraries you can start using in your project. Basically, GSAP is a property manipulator. It snags a starting value and an ending value. Then GSAP interpolates between these values 60 times per second. ScrollMagic is a plugin you can use to manage scroll animations. You can use it to animate elements based on a user’s scroll position and to pin elements at specific scroll positions. With ScrollMagic, you can also add a parallax effect to your web page. ScrollMagic works with multiple frameworks to implement animations, though the recommended solution is GSAP. The Mo.js library has a wide range of features and helps with custom motion graphics. It also works great for animating the UI and UX of your web pages. Mo.js is modular, so you can use the custom built library for your projects and avoid large file size overheads. With Mo.js you can move DOM or SVG DOM elements, but you can also create special Mo.js objects with unique features. Now let’s see how to animate your website without developers and the technologies we’ve discussed above. If you just need a simple web page, for example a basic small landing page, you can use a website builder. With a website builder, you don’t need a developer’s help as it’s possible to create web pages with a constructor. Yes, we really do mean that you don’t need code. These tools also allow you to animate elements. Readymag is a popular tool for creating web pages. One of its benefits is that it can animate elements of web pages. You can select when you want the animation to start playing and apply basic effects such as move, rotate, scale, and opacity. If you need a bit more complex of an animation you can add steps so that one effect follows another. With Readymag, you can create loading sequences, scroll animations, and click and hover animations. 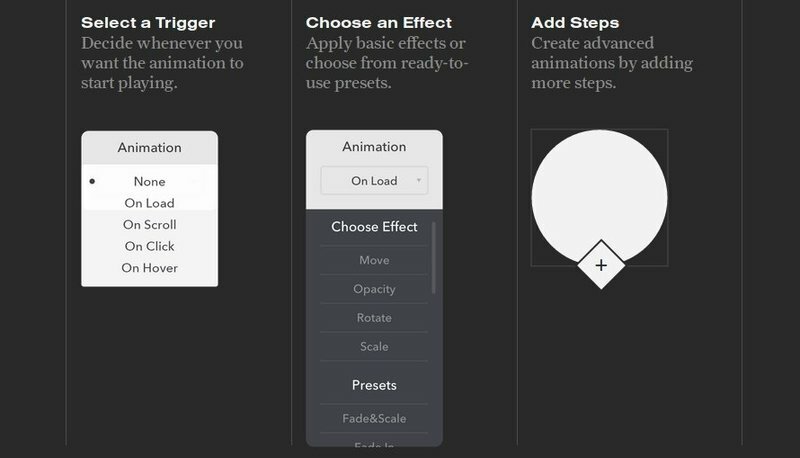 Webflow also allows you to create multi-step animations without coding. You can tie motions to scroll progress and transform element sizes, styling, and positions. With Webflow, you can also add microinteractions on different elements so they move or change with a hover or click. If you don’t want to start from scratch, you can use pre-built animations and add them to your website easily. Animation has become an important part of web design. It draws a user’s attention to the elements you want to highlight. With web page animation you can also make users stay on your website longer as catchy and interactive websites work better than boring and static ones. For different types of animations there are different technologies and approaches. Choose the type of animations you use wisely so that you don’t make your web pages heavy and slow. There are many diverse animation tools already on the market that you can use to make your web apps unique and modern. Choose the right ones to make creative and modern web apps. If you have any questions about animated web pages, contact us at any time.